Honey cranberry sauce with zesty orange and spicy cinnamon that’s naturally sweetened with honey. So easy and tasty, you’ll never buy it pre-made again! Thanksgiving is a big deal at our house. By big deal, I mean like 20+ people, two styles of turkey, a bazillion sides, a friend dressed as a pilgrim kind of big deal.We have been doing a ‘friendsgiving’ pretty much since we moved into our first rental house sometime around 10 years ago and the tradition has followed us from home to home, never dying. Its always tons of fun and goes to the wee hours of the morning, sitting around snacking, drinking far too many spiked apple ciders and wines and just enjoying time spent with good friends. Its truly one of my favorite days of the year. This year, we’re abandoning all of the hullabaloo for a low-key dinner with some, ahem, purchased sides instead. Baby is officially five days overdue and will most likely have a birthday that competes with the turkey each year. We’re going to have to get creative on making little lady’s b-day special and not abandoning this tradition that we love so much. Will we dress her as a turkey? Probably. I don’t think I’m strong enough to resist the temptation. Although this will be my mom’s first Thanksgiving back in Portland in yeeears, since they moved abroad 7 (8?) years ago, I still wouldn’t mind if little FNF baby decides to come on T-day and the feast gets pushed aside. Sorry mom, but this belly is starting to get epically uncomfortable and the sooner the better. If you’re following my Instagram stories, you’ve seen the belly shots and know that my gut is pretty out there at this point. Any day now little babykins! I’d take you over a turkey this year! Anyways, how to bring this back around to honey cranberry sauce after such a long winded tangent? If you’re not giving birth this Thanksgiving, you’re probably going to be enjoying some turkey. I never used to be into cranberry sauce as a kid, but somehow started loving it later on in life. I just like a little smidge with my turkey. It doesn’t take much to punch up the taste of the bird. What made me really start loving it was buying some really good stuff from our local New Seasons Market (a West Coast natural grocery store with amazing high quality foods). After only having the canned stuff before, I had no idea cranberry sauce could taste this good! I can’t remember the first recipe I tried that first year I made it on my own, but I do remember that it called for a cup of white sugar. At the time, I didn’t bat an eye dumping it in. As I became more informed on how different sugars affect our bodies, I decided to switch this out with honey. From there, this honey cranberry sauce recipe was born and I haven’t looked back since. Another good thing about making your own honey cranberry sauce is that it makes you look like you’ve got your Thanksgiving game on point. Its like the final touch that makes a good, homemade Thanksgiving dinner ultra impressive. The kicker? It is soooo easy! It takes about 15 – 20 mins to make and most of that time, you’re just casually stirring a pot every 2-3 minutes. NBD right? This recipe can be easily tailored too. If you like it on the sweeter side, add more honey. If you like spice, add more cinnamon and nutmeg. The world is your little cranberry filled oyster with this recipe. Plus it keeps in the fridge for ages so you can knock this recipe out a week in advance if you feel so inclined. when we do the big T-day feast at our house, I normally make this on Monday or Tuesday night so that I can focus on all of the critical dishes the Wednesday before the big day. Then its out of sight, out of mind until the feast. If you have vegans in tow this year, I have a cashew sauce roasted carrot recipe that hits all the right comfort food notes. This sage butternut squash is also pretty to-die-for as far as sides go. Or, if you straight up just don’t like cranberry sauce but still want a touch of the cran, these holiday moscow mules are pretty epic. So, if you haven’t already, put this honey cranberry sauce recipe on the menu for this year. Happy Thanksgiving to one and all! 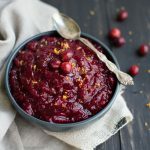 Honey cranberry sauce with zesty orange and spicy cinnamon that's naturally sweetened with honey. So easy and tasty, you'll never buy it pre-made again! In a medium saucepan set to medium-high heat, add cranberries, water, orange juice, and honey. Bring to a boil and reduce heat to low. Let thicken, stirring occasionally for about 8-10 minutes until about 80% of the cranberries half burst and the sauce is the desired thickness (sauce will thicken much more as it cools). Remove from heat and stir in orange zest, cinnamon, nutmeg and salt. Taste and adjust if desired. Watch out - it will be hot! Refrigerate in a sealed container and bring to room temperature before serving. Sauce will keep in the refrigerator for up to two weeks.